Taste test: Cooler Ranch Doritos are a true classic. They've got all the salty goodness of a regular Dorito, but without all the cheese — and a unique flavor all their own. Smell test: Pleasant ranch chip aroma. From the package: Note that these are “Cooler Ranch” — not “Cool Ranch” — as Frito-Lay changed the name several years back. Why they abandoned the better name for this one, I'll never know. 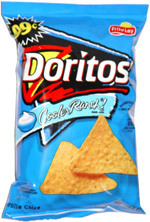 I don't think they're really any cooler than the original Cool Ranch. The introduction of Cool Ranch still ranks as one of the greatest milestones of the 20th Century, but I guess for some reason Frito-Lay thought they could top that by changing the name. Trivia: Dave Andelman, CEO of the Phantom Gourmet, has a theory that Moore's Law applies to Cool Ranch Doritos, so the amount of flavor doubles every 18 months. 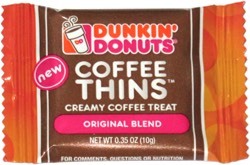 This snack was discovered by Jeremy at A & S Grocery, Framingham, Massachusetts.